When I was twenty I studied abroad for a six week period in Italy. I’m sure this won’t be the first time I mention it, since some of my most distinct food memories came from my time there. At the end of the studying portion of the trip, my family came over to join me and tour the country. My Mom and I both cook all the time so we jumped at the opportunity to take a cooking class for a few days on the Almafi Coast in a little town called Praiano. Let me tell you, if you are a foodie, love to travel and can live with breathtaking views; I would highly recommend following in our footsteps and book a trip with The International Kitchen. I can without a doubt say that I had one of the best experiences of my life during that short period of time and I’m sure my Mom would agree. 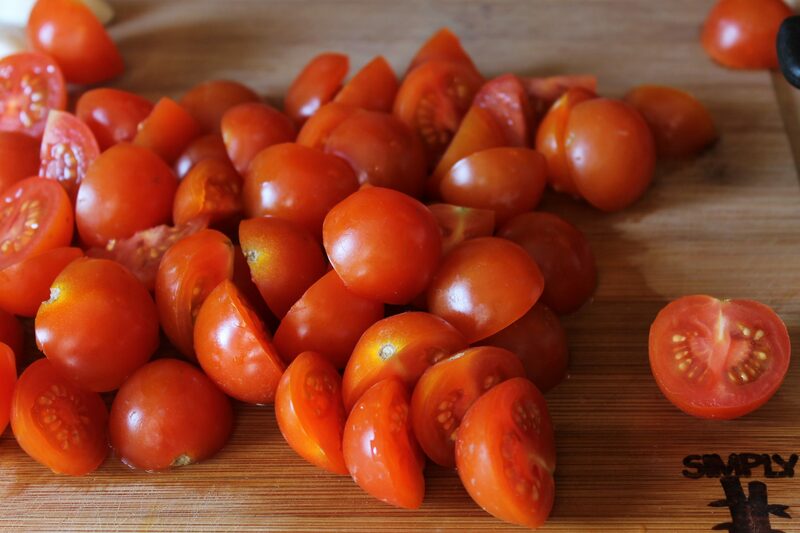 I’ll never forget our first cooking class where we made the simplest tomato sauce with fresh pasta – it’s amazing how something so simple can taste so delicious. If you can believe it, the only ingredients were a little bit of olive oil, fresh tomatoes, and salted pasta water. That’s the wonderful thing about home-style Italian cooking, all you need are a few fresh ingredients and you’ve got something that tastes as complex as a soufflé or as time consuming as Beef Bourguignon. This sauce has now become one of my staples in my everyday repertoire; it’s fast and incredibly versatile, which is why I’m devoting two whole posts to the different things that you can do with this basic cherry tomato sauce. Now, I’ve tweaked the sauce a little bit but the fundamentals are the same; fresh and in season tomatoes will yield a sweet and satisfying treat. 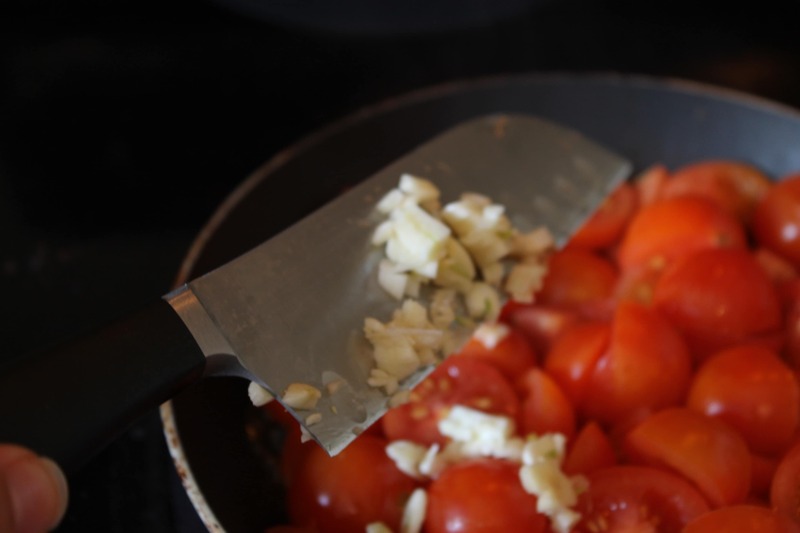 Start by halving 10.5 ounces of cherry tomatoes and slicing about four or five cloves of garlic. Less if you would like but more is always better. Add halved tomatoes to a sauce pan. Saute until the juices start to release and break down. Add garlic. I like to add a little bit of sherry or white wine. Just a splash will do. 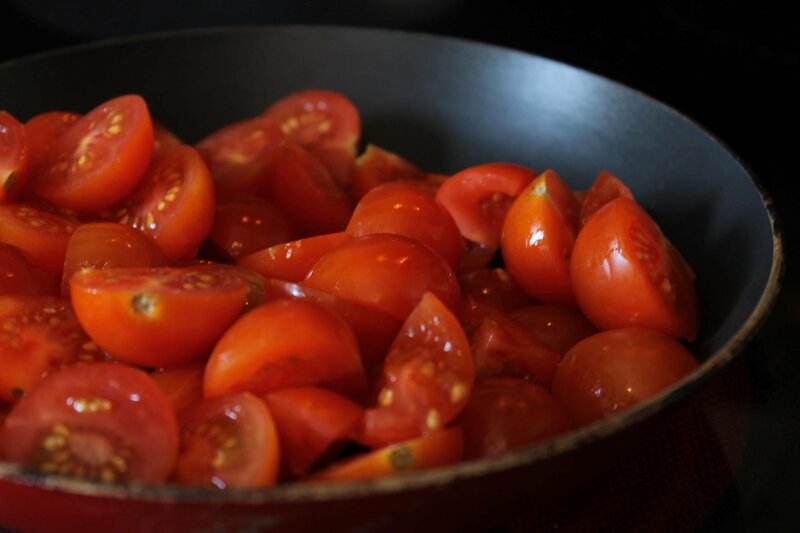 Cook until tomatoes create the perfect saucy consistency. Season with salt. 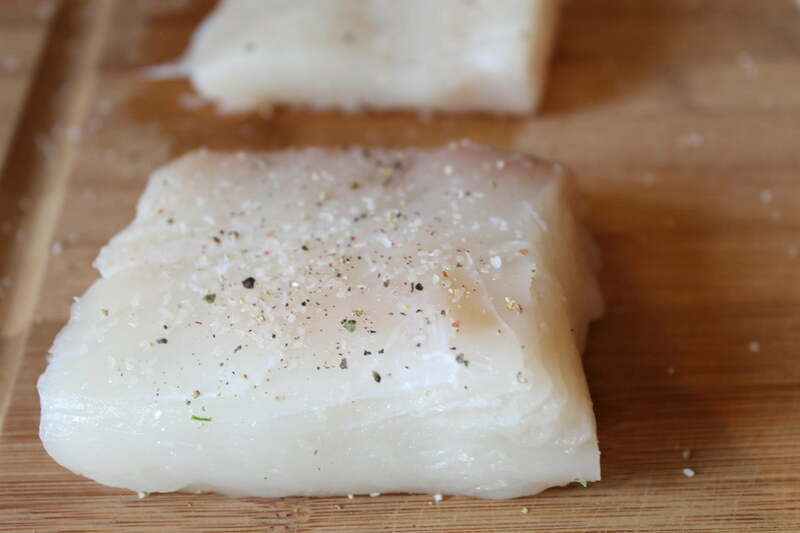 Season fish with salt and pepper. Heat some olive oil in a large saute pan. Cook fish until golden brown and cooked through; about four mintues on each side depending on the thickness of your filet’s. Season fish liberally with salt and pepper. Heat about a tablespoon of olive oil in large saute pan over medium high heat. 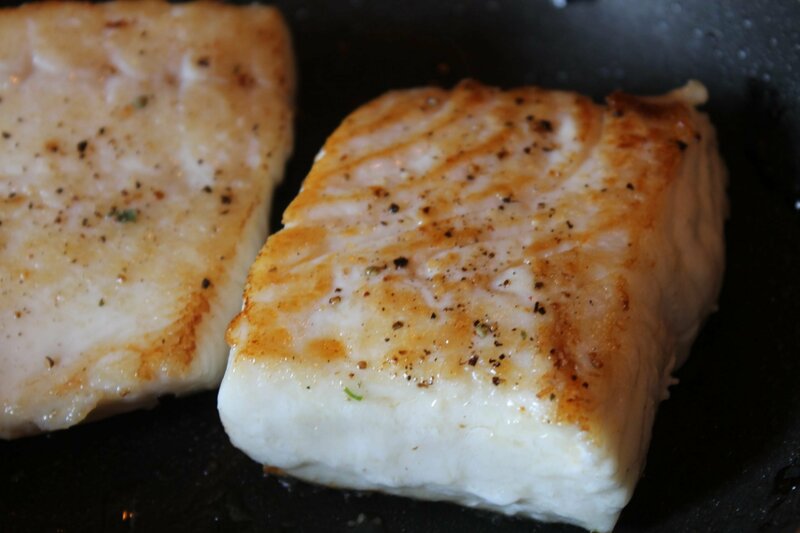 Cook Halibut until brown and cooked through; about three or four minutes per side. Serve with Cherry Tomato Sauce. 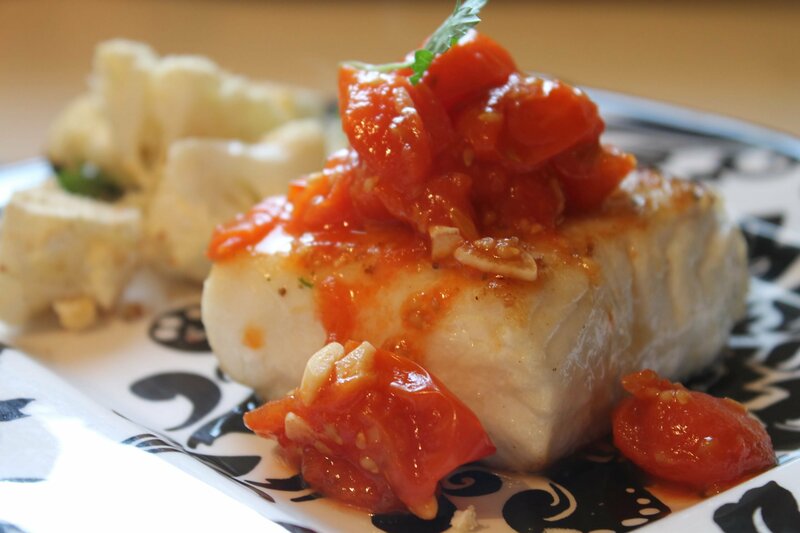 3 Responses to "Cherry Tomato Sauce with Halibut"
That tomato sauce looks awesome and so easy! Could I easily sub some olive oil for the wine? I just never have that stuff around. Yes! Definitely. Just start with about a tablespoon ot so of olive oil before you add the tomatoes. You really don’t need any wine or sherry, I just like to add it if I have it on hand. I made this last night and I think it’s a new family favorite recipe. Except I bought fresh pasta instead of making it. That pesky one year old was my excuse 😉 Thanks for the great recipe!